NEWCOMERS Jane and Dawne with Councilman Harold Henry. But Larchmont and the surrounding neighborhoods didn’t have a journal to call its own. So, equipped with optimism and enthusiasm, I will reveal how we began publishing the Larchmont Chronicle. I chose a partner and she decided on an area—Larchmont. Dawne Goodwin and I had met at a previous job—she was a very attractive redhead with big blue eyes, clothes that showed off her cleavage and great legs. I went with her to call on potential advertising customers door to door. We enlisted Dawne’s boyfriend who was in the printing business, my husband who is a CPA, and added my editorial expertise, threw them in the mix, and we had the ingredients for the Great Experiment. Next, Dawne and I called on 20 to 30 Larchmont Blvd. business owners to interest them in buying ads. We found one advertiser who committed to two full pages, and 20 others who said they would “try” it. That support gave us the green light to go ahead. THE DEBUT ISSUE set the pace with Big News. Then we found Big News: the threat of the proposed Beverly Hills Freeway running through Hancock Park. This became the headline of the first 12-page issue in 1963—the issue that needed to get the attention of 10,000 families. We asked our advertisers for payment in advance because the printer wanted his money up front. We created a budget, determined overhead and were able to make money—$125 each on the first issue. Our first issue was mailed to Hancock Park and Windsor Square, Brookside, Windsor Village, Wilshire Park and Larchmont Village. The reaction: positive, and we received favorable comments from people who helped us get the news. We got new advertisers to sign up for a year. The attributes needed to run a newspaper are: luck, timing, ambition, diplomacy, gregariousness, more luck, curiosity and fearlessness. Our partnership flourished on mutual trust and admiration. We divided the duties easily: Dawne handled advertising sales and I handled writing: she couldn’t spell and I couldn’t sell. We found office space and a year later moved to Larchmont Blvd. (upper Larchmont) and hired our first employee, a secretary/bookkeeper. In two years we tripled our pages, from 12 to 36. Larchmont and its surrounding neighborhoods were the core communities we served, but we also covered Wilshire Center, which began its building boom in the 1970s with new high rise buildings sprouting up like mushrooms. And our involvement with the Wilshire Chamber of Commerce grew right along with the burgeoning business community. In 10 years we had grown, moved to larger offices and had a staff of seven. We had the amazing Lucy Toberman as our society columnist, later Mr. Blackwell as our lifestyle columnist. We expanded our readership to include an additional 4,200 families at Park La Brea and households in Miracle Mile. Now the paper is delivered monthly to 22,000 families. 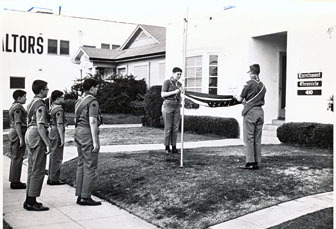 OUR FIRST office at 410 N. Larchmont. In 1973, we took a deep breath and switched from mailing the paper to delivering it in a clear plastic bag to be left on the doorstep. 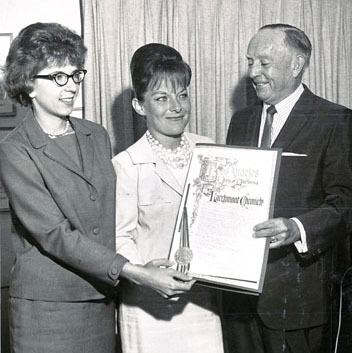 By the 1980s we were serving on dozens of civic boards, had co-founded the local Historical Society and chaired the Wilshire Boulevard Centennial celebration. In the 1990s good luck continued to be on our side. Computers came into existence, making it far easier to put the paper together. Instead of cutting and pasting and dealing with pink message slips, we had voice mail, then e-mail and many more conveniences. It also was when my partner decided to retire, and I went solo. How do you stay around? It’s no secret on how we have continued to keep the Larchmont Chronicle in business for the past 50 years. We have a loyal readership who look forward to getting the paper on their doorstep every month and who patronize our advertisers. 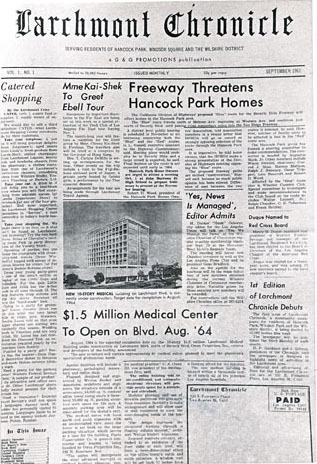 We’ve kept them interested with these stories: the proposed multi-highrise (Park La Brea-like) complex for Fremont Place, move of the Art Museum to Miracle Mile, new museums Page and Peterson, closing of Bullock’s Wilshire, I. Magnin, the May Company, the Scottish Rite Temple; razing of Black Foxe Academy, the 1992 riots, the 1994 earthquake, fires at Wilshire Presbyterian Church and Los Angeles High School, historic preservation zoning, restaurant and take-out implosion on the boulevard, schools, elections, etc. And because we focus on local news, we have the support of our loyal advertisers who participate with us year after year, and the new ones who sign on. 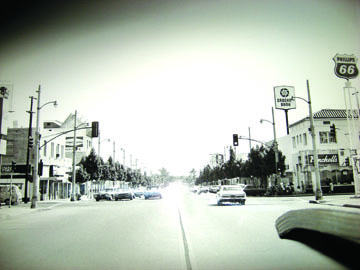 LARCHMONT BOULEVARD circa 1963, when the Chronicle was born. It’s also the dedication of our loyal staff: Pam Rudy, who grew up in the neighborhood and is very active in community activities. She is an advertising representative extraordinaire; Suzan Filipek, associate editor, who is skilled at covering the news; Laura Eversz, assistant editor, who capably wears a variety of hats and also is our resident techie; Yvonne Auerbach, our dedicated accounting manager who keeps us solvent; Rachel Olivier, a talented Jill of all trades and our newest proofreader; Dina Nicholau, our creative production manager and graphics designer. Our columnists: Tom LaBonge, Danielle Avasian, Bill Bentley, Jack Humphreville, Patty Hill, Helene Siefert, Patricia Rye and Tony Medley. You see—that’s how simple it is to start (and continue) a newspaper.